Oh, guys, do I have a doozy of a recipe for you today! 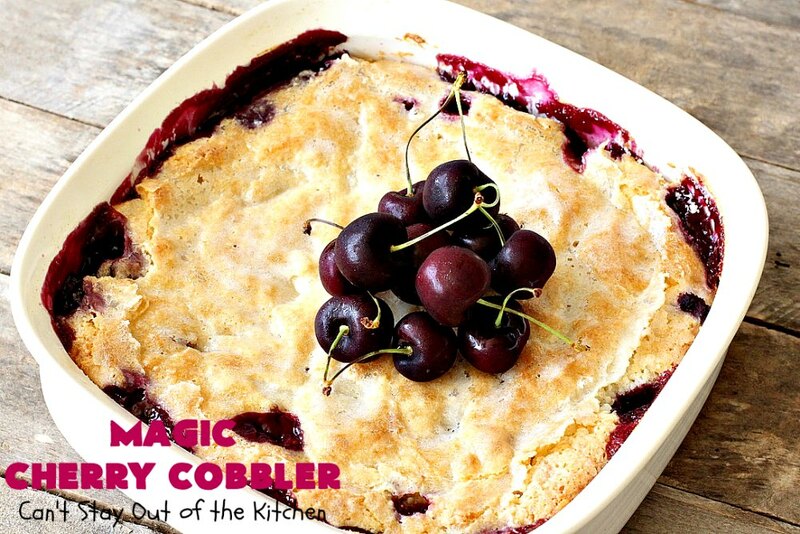 Magic Cherry Cobbler. Yes, this recipe is magical. 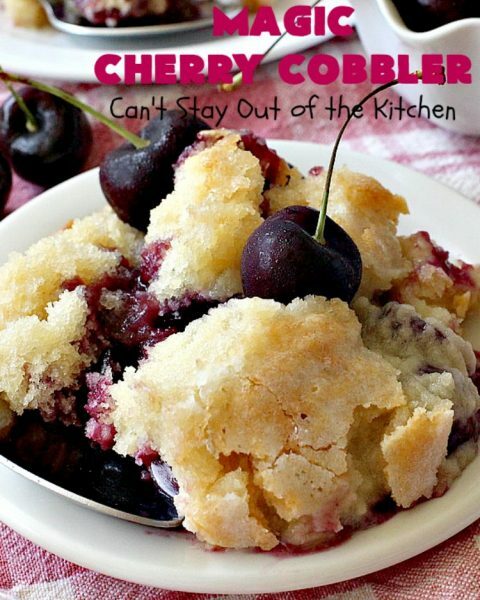 It is one of the most spectacular Cherry Cobbler recipes you’ll ever eat. No kidding. 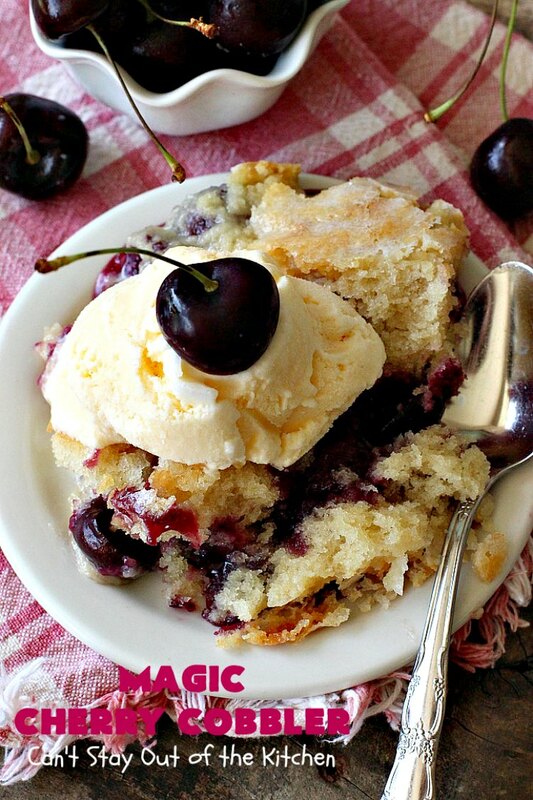 This fantastic dessert layers fresh cherries on the bottom. Then it has a topping layer. After that you sprinkle sugar and boiling water on top. All the ingredients kind of mix together as they bake. The crust is so amazing. Except for the fact that you have to pit cherries, it’s also incredibly easy to toss together. If you’ve been following my blog recently, you know I’ve posted quite a few cherry desserts. I absolutely love them. 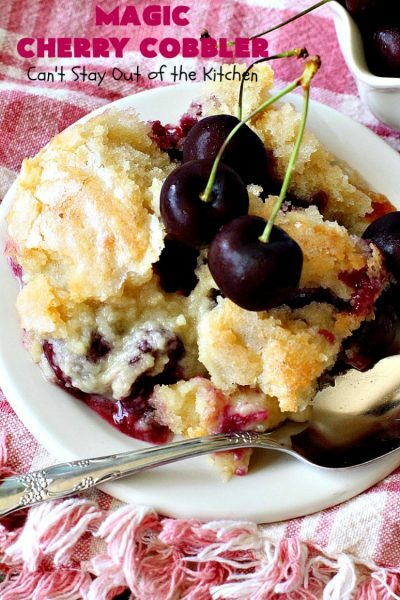 This cobbler is no different. Fresh cherries are in season for only a couple of months during the summer. 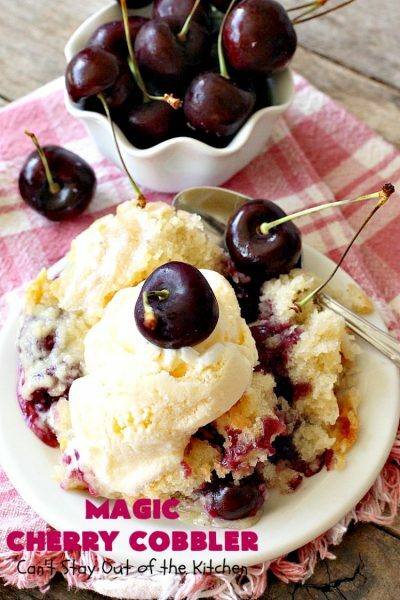 I try to make the most of it by using cherries frequently in desserts. Of course, I also enjoy eating cherries fresh, just out of the bag. Ah, yes. cherries are really something special. I served this last Friday night for our care group potluck. To say it was a hit with everyone is an understatement. It was phenomenal. Everyone in our care group likes Blue Bell (ice cream) on desserts….cakes, pies, even cookies or brownies! So we served it ala mode. Everyone drooled over it. You have to experience this luscious dessert to believe it. 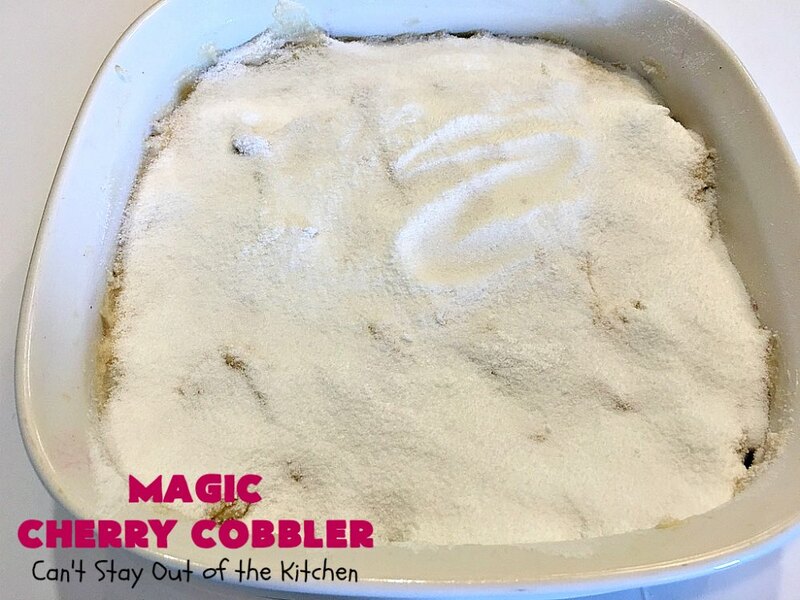 I first tried this recipe with my Magic Peach Cobbler. Out of all the Peach Cobbler recipes I made in the summer of 2014, that was our favorite one. 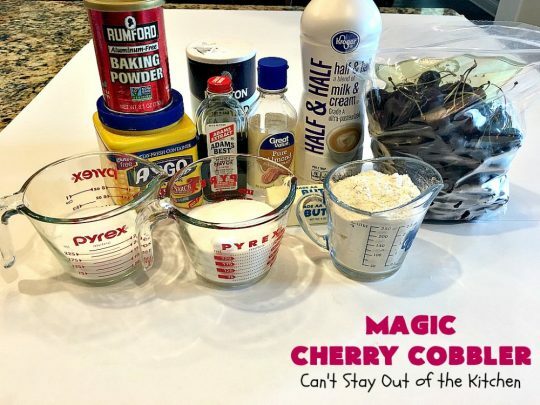 I wondered what the recipe would be like using cherries and substituting almond extract for the cinnamon. It was awesome. Magic Cherry Cobbler is awesome! 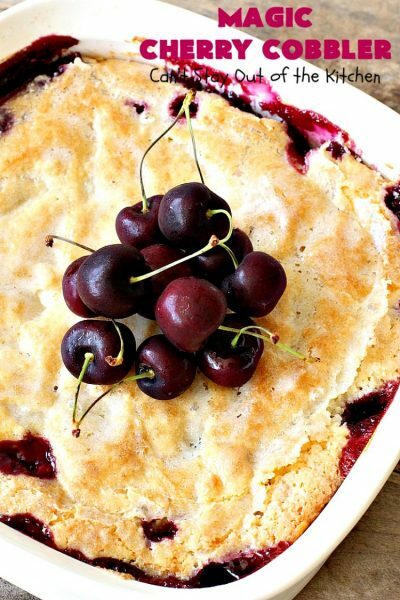 This dessert is terrific for company–especially in the summer when you can use fresh cherries. All of our guests drooled over this dessert. 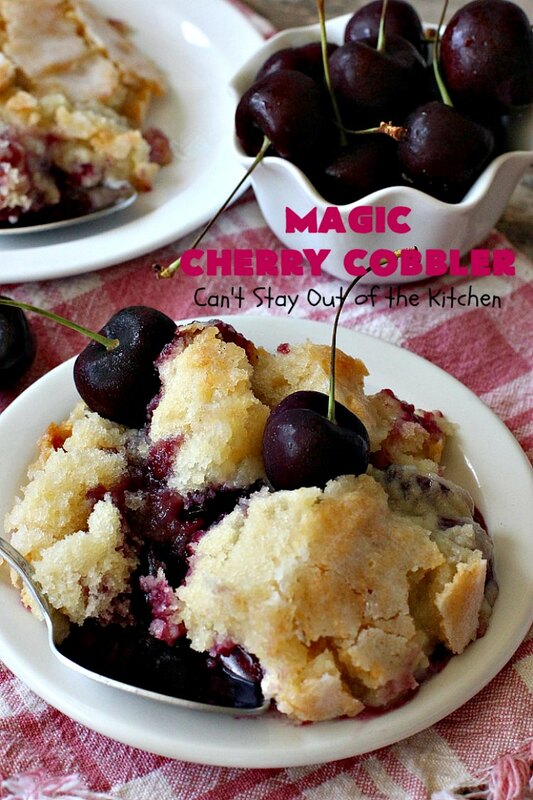 We served Magic Cherry Cobbler, ala mode. Yum. Pit and halve cherries. Pat cherries dry before placing in a greased 9×9″ glass baking dish. Soften butter. Add sugar, vanilla extract and almond extract. Add UNBLEACHED all-purpose flour. (Bleached flour toughens baked goods). Add baking powder, salt and half-and-half. Spread topping ingredients over top of cherry layer as evenly as possible. Combine cornstarch and 1/2 cup sugar. Sprinkle over top of topping layer. Pour boiling water over top of sugar layer to cover as evenly as possible. 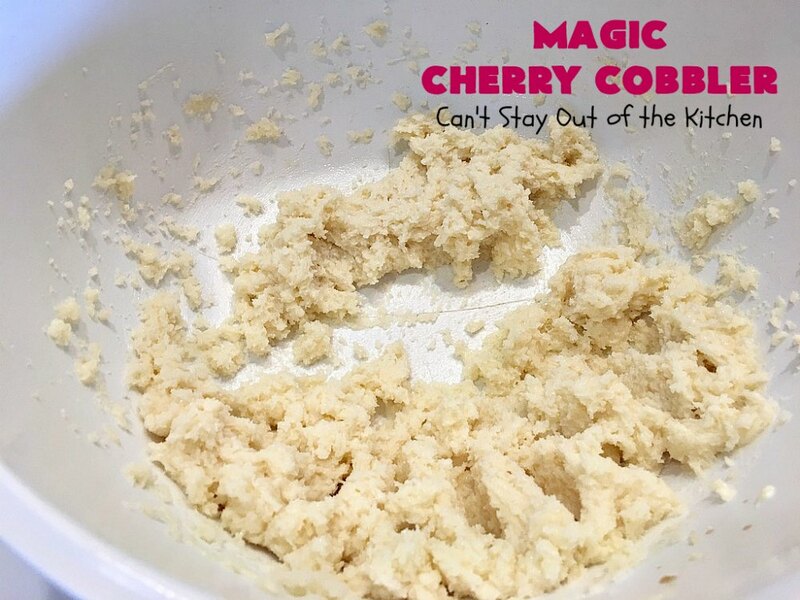 Every mouthful of Magic Cherry Cobbler was utterly delightful. This picture shows how the crust topping hardens while baking. Everyone really loved that part of the dessert. 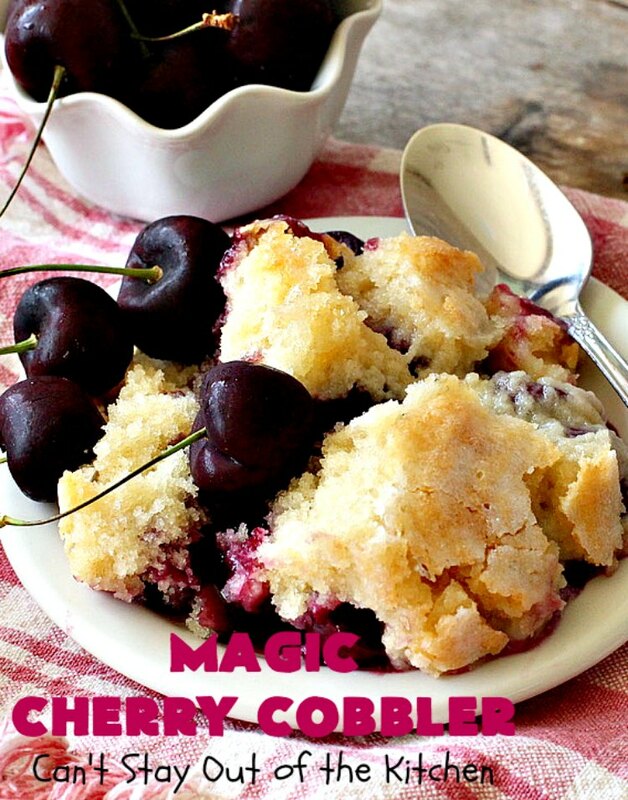 Whether you serve Magic Cherry Cobbler ala mode or plain, this is one scrumptious dessert. 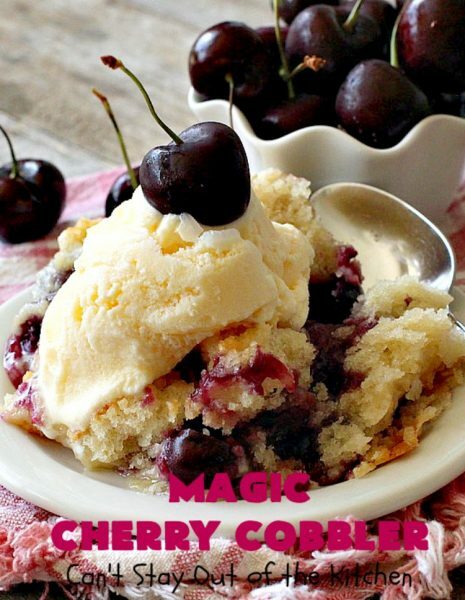 Magic Cherry Cobbler is truly magical! 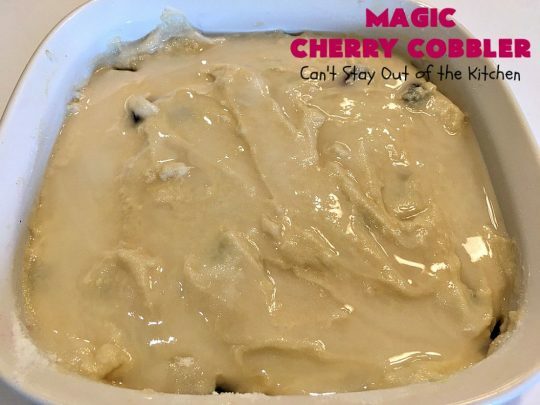 This dessert is layered with fresh cherries, topping, sugar & then boiling water is poured over top before baking. It magically transforms into the most scrumptious and delectable cherry cobbler ever! This is a fabulous dessert during the summer when fresh cherries are in season. Spray a 9x9” glass baking dish with cooking spray. 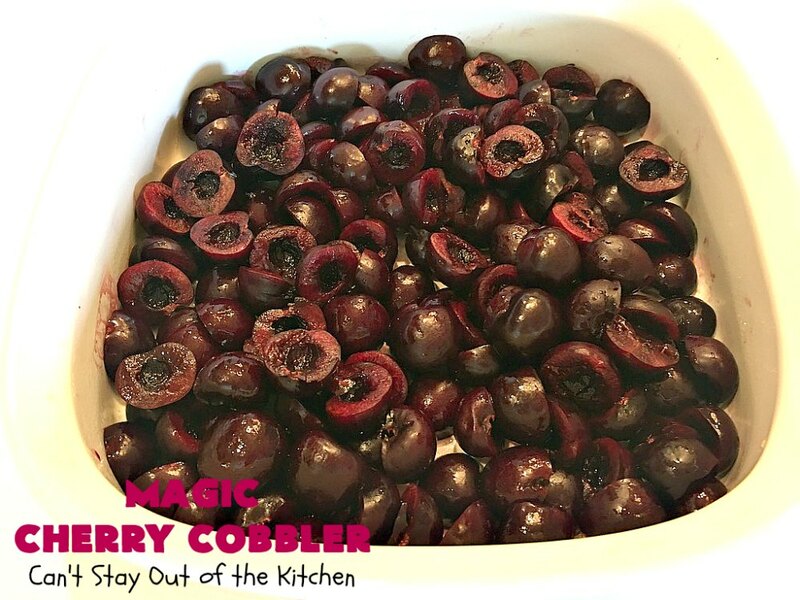 Arrange cherries in the bottom of prepared baking dish. 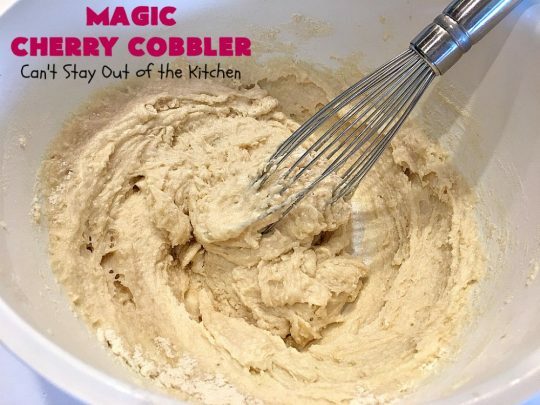 Cream 3/4 cup sugar, butter, almond extract and vanilla in a mixing bowl with an electric mixer until smooth. 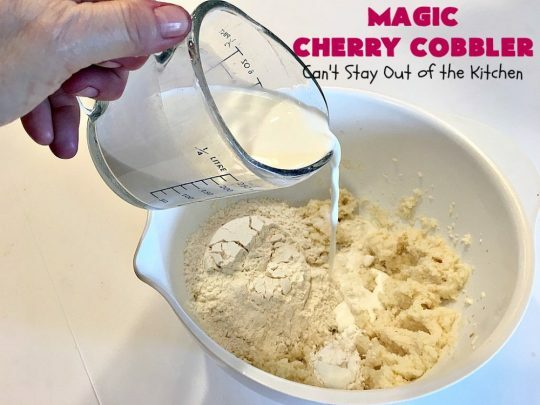 Add half-and-half, flour, salt and baking powder and continue mixing with mixer until creamy. 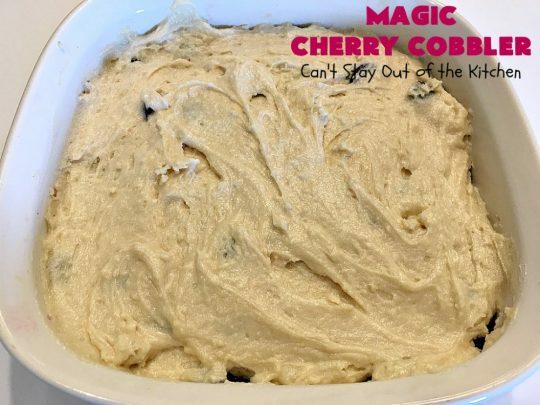 Spread batter evenly over the cherries in baking dish. 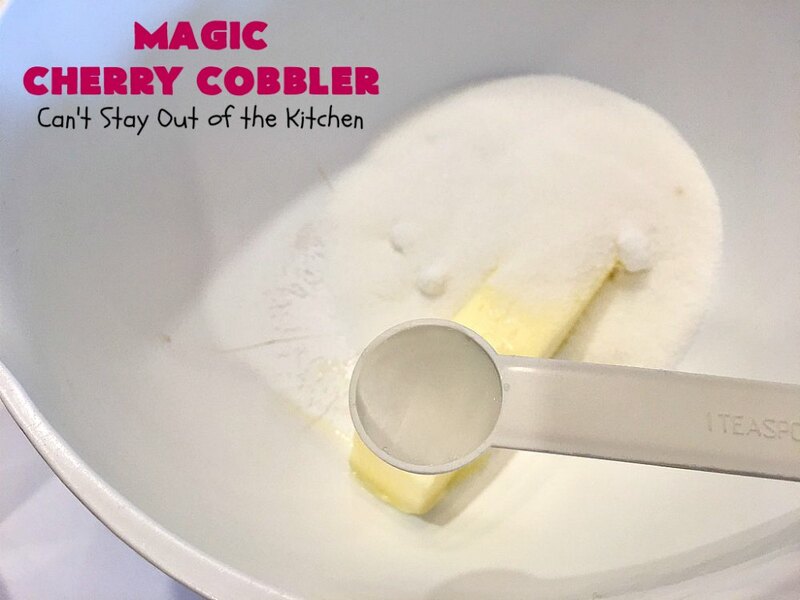 In a small bowl, combine ½ cup sugar and cornstarch. 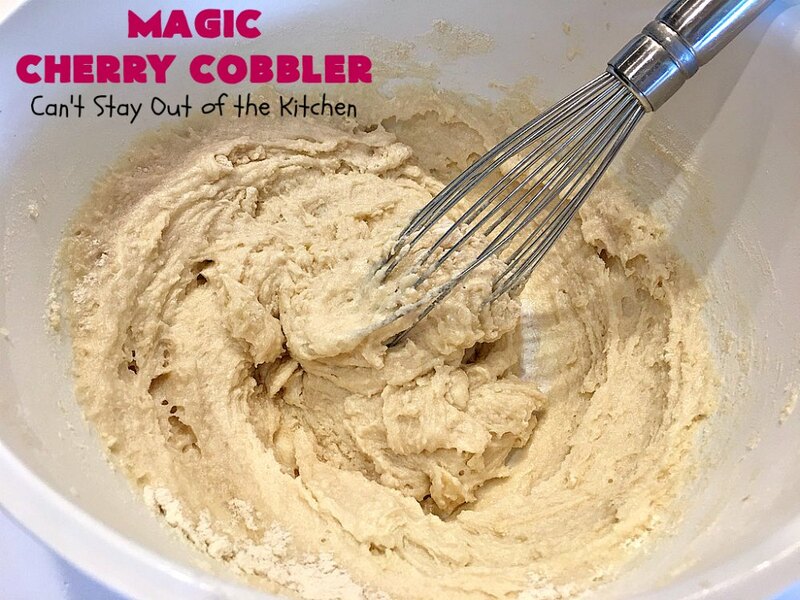 Sprinkle the sugar mixture evenly over the batter. Pour the boiling water over top. Make sure all of the sugar is covered with water and no dry spots remain. Bake at 375° for 40-45 minutes. Serve with ice cream or non-dairy whipped topping. NOTE: Pat the cherries dry with paper towels before putting in prepared baking dish. NOTE: Preparation time will be reduced if you have a cherry pitter. 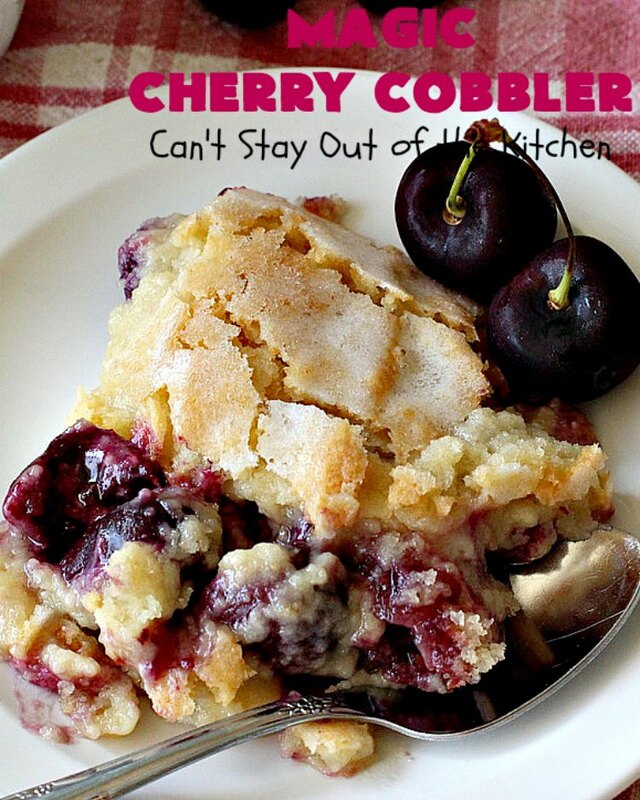 NOTE: You can substitute canned cherries for fresh cherries in the recipe. But you will need to rinse, drain and pat the cherries dry before using. You will probably need about 3 cans to get the right volume for the recipe. We loved Magic Cherry Cobbler. Magic Cherry Cobbler is one of the best cobbler desserts I’ve ever made. You’ll love it too.